Well…I have a pet hedgehog and 3 brothers. I like swimming and just hanging out with my friends when I can… – Confused? So is the employer listening to your ridiculous answer to your first interview question “tell me about yourself.” You think I’m joking? I’ve heard answers like this before and had to keep a straight face. 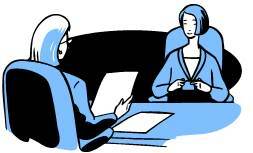 So, save yourself and your interviewer the awkward moment and prepare yourself before going to an interview! The Career Resource Centre holds valuable information to help you prepare for your interview. But for those of you scrambling at the last minute I will be your savior for the next 5 minutes. You’re welcome. Let’s review the top 5 questions and how you can go about answering them. Ah, the famous icebreaker to an interview. The key is to be concise. Being a chatty patty can ward off the interviewer but being too short is bland. Keep your answer professional and focus on your experience, work attributes and skills. If they want to know more they’ll ask! It’s the most obvious question to ask, yet so many people are surprised by it. (Provide 3 examples each.) Instead of trying to toot your own horn discuss the positive feedback you’ve received from past employers/coworkers who’ve commended your skills at working under pressure, balancing priorities and getting the job done. The only wrong answer for a weakness would be time management, working with others or difficulty taking direction. Always provide an answer to how you are overcoming these weaknesses. How would you fit into the position/company? Or What can you do for us? The million-dollar question. If you’ve done your research on the company and read the job posting you’ll be able to highlight parts of your resume to explain why you’re the perfect fit. How would your previous employer describe you? Emphasize your skills. They don’t need to know you’re friendly, they can already tell if you are or not. Tell me about a time when you faced a conflict and how you solved it. Choose a situation you have actually dealt with yourself. The employer wants to know how you approach problems and determine if you are creative in resolving difficult situations. Do not say you’ve never been involved in a conflict – pick something, even if it involved school or a sport etc.